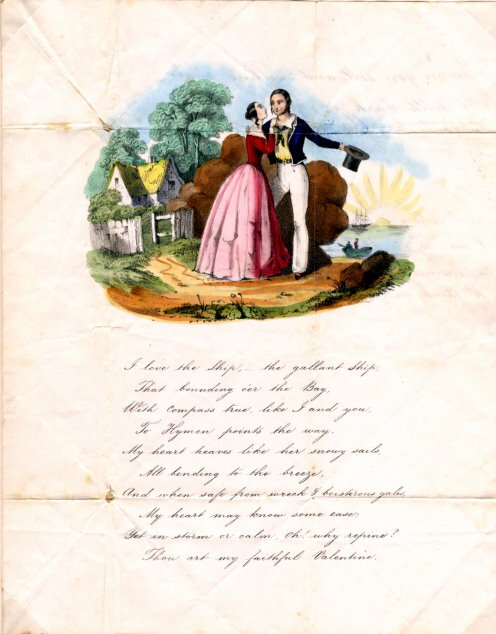 This 1802 valentine shows a watercolour of a man and woman embracing with a boat in the background. The poem reads: I love the ship, - the gallant ship, That bounding o'er the Bay, With compass true, like I and you, To Hymen points the way. My heart heaves like her snowy sails, All bending to the breeze, And when safe from wreck and boisterous gales, My heart may know some ease; Yet in storms or calm, oh! why repine? Thou art my faithful valentine.